SOIL FERTILITY BENEFITS OF WHEAT IN ROTATION | Chatham-Kent Agriculture Development | We Grow For the World! Long-term research at the University of Guelph’s Ridgetown Campus shows that winter wheat in rotation provides an additional 10 bushels per acre to corn and 5 bushels to soybeans. At current crop prices, that means an extra $107 per acre over a rotation. Wheat also provides an opportunity to seed a cover crop. In the case of red clover, the economics are clear: a full stand of red clover provides a nitrogen credit of 65-80 lbs per acre to the following corn crop. 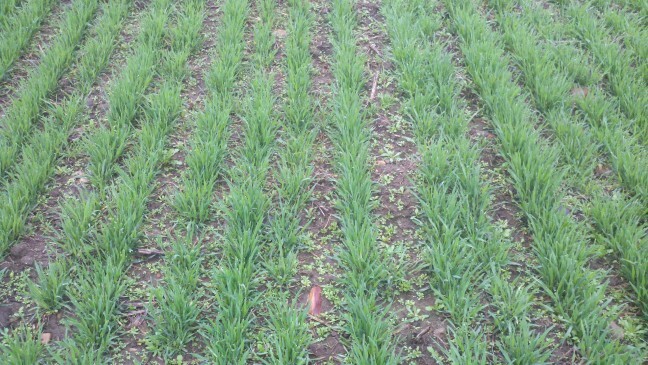 If red clover establishment is difficult, another cover crop, such as oats, can be seeded. Although oats will not provide any nitrogen, its fibrous root system will set up the next crop with improved soil structure – this is particularly helpful in dry years, where a good root system is critical for nutrient uptake. A recent review of decades’ worth of Ontario research has shown that when soil test phosphorus is within the range of 12-18 ppm (Olsen), starter fertilizer rates (i.e. 20-30 lbs P2O5/acre) achieve the most economic response for field crops. The same is true for potassium when levels are between 100-130 ppm. More recent research from OMAFRA/University of Guelph long-term P and K trials suggest that slightly higher soil test values (e.g. >20 ppm P and >120 ppm K) may be worth pursuing in some circumstances. This Report includes data from WIN and Environment Canada.